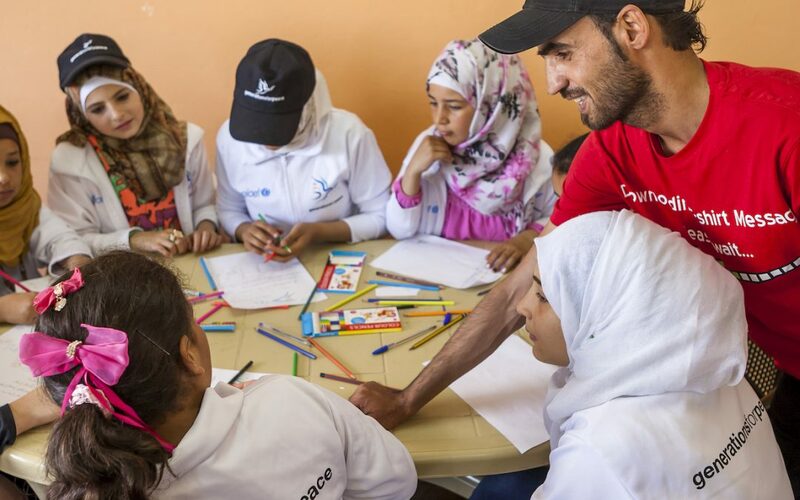 The Arts For Peace approach to conflict transformation, used by Generations For Peace (GFP) volunteers to effect change in their communities, is one of five GFP vehicles for peace building alongside: sport, advocacy, dialogue and empowerment. Whilst GFP started as an organisation focused solely on Sport For Peace, and still remains the only peace-through-sport organisation officially recognised by the International Olympic Committee, it has since added arts to its repertoire. So why the inclusion of arts? GFP recognises that, just as with sports, arts have the ability to bring people together through a safe and creative means in order to promote positive behavioural change and ultimately, foster conflict transformation. This post, which highlights the Arts For Peace approach, is the second in a series of five blog posts on GFP’s vehicles for peace. Art refers to anything created with imagination and intended to convey beauty and/or to express important ideas or feelings. Art, whether in the form of theatre, sculpture, fashion or otherwise, can serve as a means of expressing emotions, such as anger, confusion, happiness or sadness. But, art can also exist “for art’s sake” and serve no purpose beyond its production. Art does not have to be aesthetically pleasing, nor does it have to follow stringent rules. The purpose of art is unique to each artist. In addition to serving as an emotional release and form of decoration, art has been used, throughout history, to address social inequality and cultural oppression, political instability. It is no different today, in a world where artists like Banksy depict social injustices in the form of graffiti murals in public spaces. He, like many artists before him, uses art as a means of social commentary. What is Arts For Peace? Arts For Peace involves carefully facilitated arts-based activities, such as theatre, dance, painting, yoga, and music to foster positive behavioural change. As with sport, art is used as an entry point for peace building. The purpose of Arts For Peace is not art itself, but rather the means through which to convey conflict transformation objectives. So what is it about arts that can make it an effective entry point and vehicle for peace building? Arts allow you to target children and youth: art is creative and flexible, making it an excellent tool for younger target groups. Art can act as a positive distraction for children suffering either directly or indirectly from conflicts in their communities. Arts For Peace allows children and youth a temporary escape from destructive conflict and simultaneously provides them with an outlet for their emotions, opinions, and hopes for the future. In many cases, arts also result in tangible products that grant parents, or guardians insight into a child’s feelings. Moreover, arts encourage children and youth to think, problem solve, use symbols, and record thoughts, ideas and feelings in innovative ways. Arts offer a voice to the disempowered: Art forms such as drawing and sculpting grant individuals a canvas upon which to express emotions that they are unable to express with words. Thus, those who are reluctant to verbalise their thoughts and fears can do so through art. Art can act as a non-verbal language that is accessible to all regardless of gender, social standing, political affiliation or religion. For example, individuals who have suppressed traumatic experiences may feel safer expressing their emotions with paint. Also, dance and theatre allow individuals to use their physical bodies to communicate. Arts offer an individual experience: Art forms allow for self-expression. Whether one sketches to find clarity after an episode of violence, or writes in a journal to explore repressed feelings, art can be a very personal and private experience. Arts offer a collective experience: Because art is an unspoken language, it can be used as a tool for communication between conflicting parties in a way that dialogue might not be. For example, through theatre, the observer may see the pain in the actor’s movements, or may be able to relate to the symbolism communicated through the script. Theatre can also be interactive where the audience is involved in shaping how the play actually unfolds. Arts offer tangible messages of change: Art allows for the creation of tangible products, such as drawings, photographs, and performances, that can be shared with the wider community. Emotions that cannot be expressed in words may be expressed through a painting, poem, or sculpture displayed for others. On a larger scale, theatre, spoken word, rap, documentary filmmaking, public murals, and other forms of Arts For Peace that are created specifically for, and sometimes with, audiences, invite, for example, community members to face the conflict being addressed by the volunteers or youth taking part in GFP programme. Arts are cost-effective: arts can support significant positive sustainable change in a community, at relatively low cost. Rather than requiring specific tools, arts can be done using the resources available. The only resource necessary for art is an imagination. Generations For Peace recognises that Arts For Peace programmes require some degree of structure to ensure that the results are beyond the production of works of art alone. This is ensured via the use of the GFP Programming Framework. The GFP Programming Framework ensures that all our programmes have a clear theory of change, a precise focus on a particular dimension of conflict, a specifically-identified Target Group and Beneficiary Community, and carefully-chosen activities with clear indicators to measure outcomes and impacts. Apart from rich programming using the GFP Programming Framework, what else must we remember to avoid risks and ensure successful Arts For Peace activities? Consider the audience: Those carrying out Arts For Peace programming should be confident, flexible and fun and keep the Target Group in mind when designing an arts-based activity. Planning on writing letters or poems with children who struggle to read would only bore and frustrate them. In this instance, it may be better to have the Target Group utilise painting, crafting or drama. Be creative: The ability to draw connections between peace building and art is part of the creativity. Asking your Target Group to perform a silent play may be a fun and inexpensive exercise, but it needs to connect to conflict transformation to be categorised as Arts For Peace. It would be better to ask the Target Group to create a play, a song, or a mural, about what peace would look like in their community. Thereafter, the Beneficiary Community, or the programme stakeholders could be encouraged to discuss what peace would look like for them – resulting in a larger discussion stemming from an artistic expression. Prioritise facilitation: Being a good painter, dancer, or poet is not necessary to facilitate an Arts For Peace Programme. A facilitator is not an expert but an enabler, a guide to help others express themselves, communicate with each other through art and accomplish the desired outcome. The end goal is to achieve peace-building objectives, not to improve the Target Groups’ painting technique or ability to act. Activity combinations: Art alone may not achieve peace, but carefully-designed Arts For Peace activities can make an important contribution to transforming existing conflict in the community, and their impact can be reinforced and multiplied if used in combination with other activities in parallel in the community, such as Sport, Advocacy, Dialogue, or Empowerment For Peace. Activities must be regular and sustained over time: As with any other vehicle for peace building that GFP volunteers use, one-off events do not lead to sustained impact. To secure lasting positive changes in attitudes and behaviour, Arts For Peace activities must attract and retain the participation of a Target Group in regular (often weekly) sessions that build progressively on each other over a sustained period. As well, to ensure sustained, and effective programming, constant feedback collection from Arts For Peace participants and adaptation of content are also necessary. Inclusive: Art is a simple and effective tool that all can participate in, regardless of gender, age, religion, ethnicity, political affiliation, and physical ability. Art also provides a voice for those who may otherwise lack an outlet. Recognising that art is a language of its own, Generations For Peace encourages the use of art in all its forms, including traditional disciplines like painting, music and theatre, and more unique forms such as animation and ornamenting.